^ Douglas Richardson. Plantagenet Ancestry: Plantagenet Ancestry: A Study In Colonial And Medieval Families, 2nd Edition, 2011. pg 401. Geanakoplos, Deno (1975). "Byzantium and the Crusades, 1354–1453". 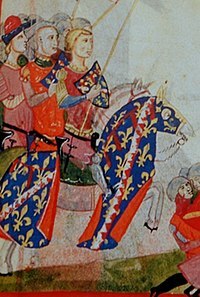 In Hazard, Harry W. A History of the Crusades, Volume III: The fourteenth and fifteenth centuries. University of Wisconsin Press. pp. 27–68. ISBN 0-299-06670-3.